Improving freight movement in the region stretching from Chicago to the Pacific Northwest is the focus of a new research and outreach center at North Dakota State University, Washington State University and the University of Washington. "Regional freight transportation issues are gaining importance almost daily," U.S. Senator Byron Dorgan said. "The interstate nature of today's commerce-and the inter-jurisdictional issues that arise from it-demand that we think more broadly. I think this new effort to look for more and better ways to improve freight transportation in the region is an exciting step in the right direction. Improving our regional freight system will help businesses and industries in our rural communities, and our farmers, compete more effectively in today's global marketplace." 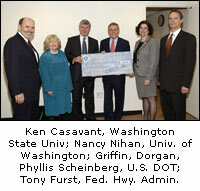 The Northern Plains-Pacific Northwest Center for Freight Mobility is funded through a $500,000 appropriation in the 2005 Department of Transportation Appropriations Act. Dorgan said the three universities have long-standing transportation research and outreach programs, making them well-suited to a regional collaborative effort. The 12 states in the region share similarities, including small communities and large, sparsely-populated areas with a historical economic dependence on agriculture. "Businesses are continually evaluating locations and adjusting operations to meet the changing economic and political environment. We see this center playing an important role in monitoring and predicting these changes and the resulting impact on infrastructure and freight transportation providers. As a result, our region will improve its competitiveness in a global economy," notes Ken Casavant, professor of agricultural and resource economics at Washington State University. Transportation security will also be a focus of the center. "Freight transportation is responsible for moving a great deal of hazardous material," notes Nancy Nihan, Department of Civil and Environmental Engineering at the University of Washington. "At the same time, freight transportation of just about any kind could be subject to potential terrorism. These factors pose important threats to the security of those located in and around freight movements. This is to say nothing of the potential impacts on commerce and the economy. A better understanding of regional freight transportation can only help understand and mitigate such potential threats." "We will be the first to look at these kinds of transportation issues on a broad regional scale," notes Gene Griffin, director of the Upper Great Plains Transportation Institute at NDSU. "That will give this region the ability to develop some competitive advantages in freight transportation. Secondly, it will establish a model for research and outreach in other parts of nation." In its initial months the center will develop a profile of the region's freight infrastructure and economic traffic. It will survey state department of transportation directors and personnel to learn about issues and research needs. Those steps will help identify critical freight planning issues. Center collaborators will promote a regional perspective in freight planning and policy making. They will also work with state departments of transportation to assess their ability to address freight planning, operations and policy issues in a regional context. Finally, they will work to enhance the understanding and visibility of freight transportation among policy makers.